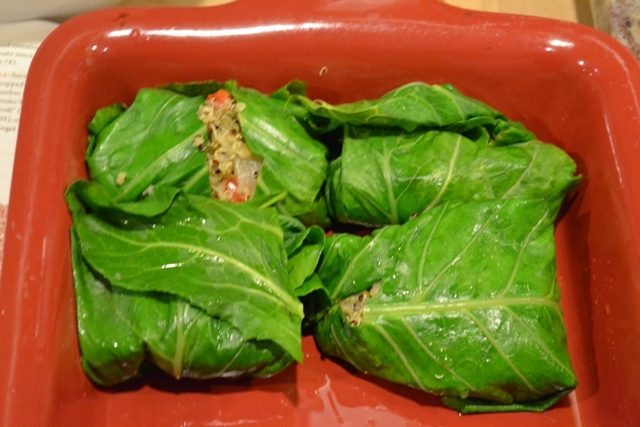 The original recipe is called “Quinoa and Collard Leaf Dolmas” and is from The Moosewood Restaurant: Cooking for Health, which has all vegetarian and vegan recipes. We made a few small changes and although the finished product was tasty, the recipe was a little cumbersome to make. Preheat oven to 375. Cook the quinoa according to the package directions. 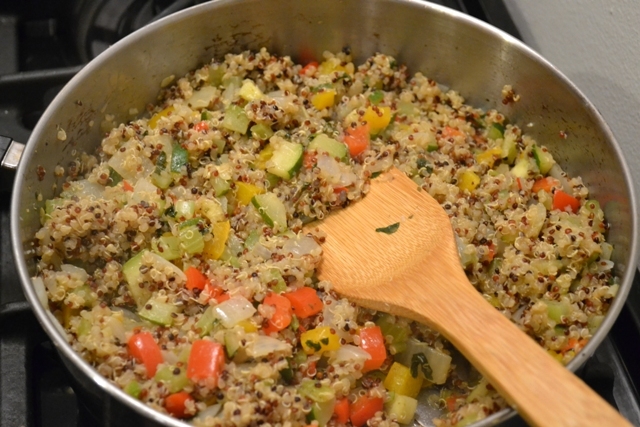 While the quinoa is cooking, heat the oil in a large skillet and add the chopped onion. Cook until the onions become translucent, about 8-10 minutes. 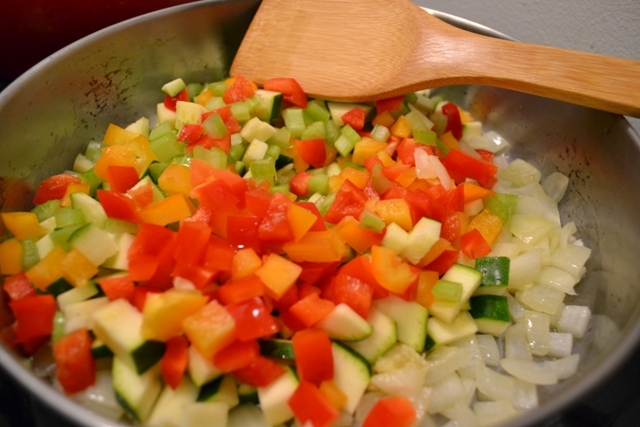 Stir in the garlic, peppers, celery, zucchini, oregano, and mint. Cover and cook for about 10 minutes, until the vegetables are tender. Add the cooked quinoa and lemon juice to the vegetables and stir well. Cut the large part of the stem out of each collard leaf. Steam the leaves until they soften enough to manipulate easily. Let them cool and then lay them, one by one, on a cutting board and slightly overlap the leaf where the stem was removed. Add 1/2 cup of the quinoa/vegetable mixture on top. Fold the sides of the leaf over the filling and then roll it up, making a neat package. Place the little package, seam down, in an 8×8 pan. 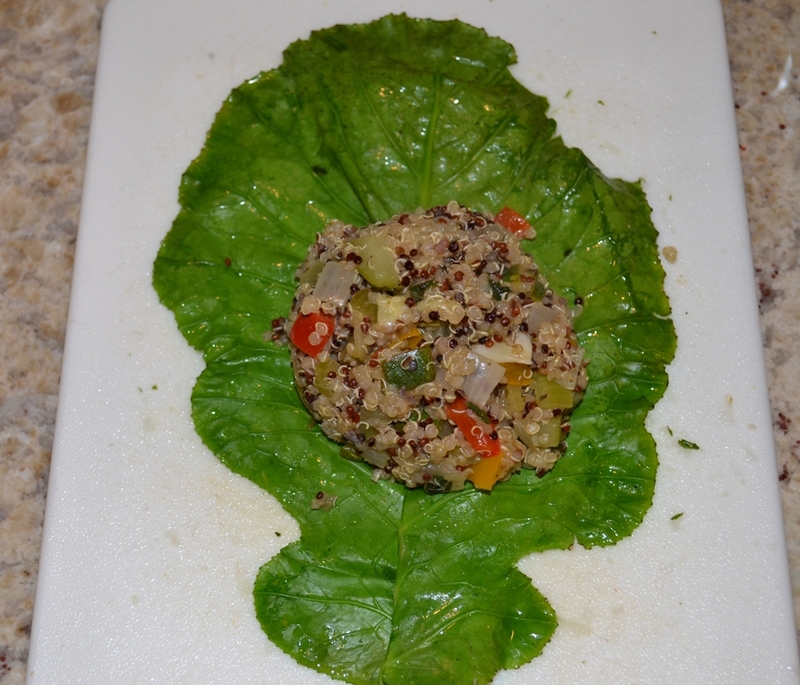 Repeat with the rest of the leaves, using the rest of the quinoa/vegetable mixture. All eight leaves will fit perfectly in the pan. Top the 8 leaves with your favorite pasta sauce. Cover with aluminum foil and bake at 375 for 20 minutes or until hot. 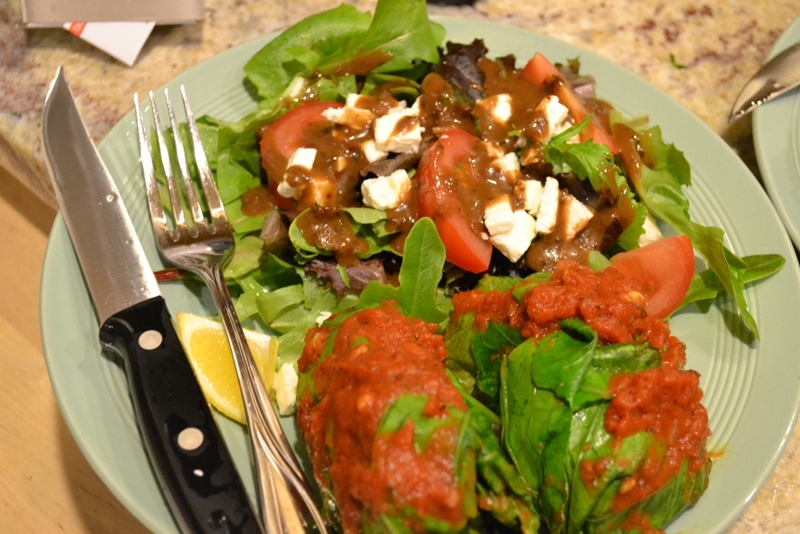 We ate these with a salad topped with feta and they were delicious!